The first of the quarter-finals at the 2017 Aegon International in Eastbourne saw Caroline Wozniacki outlast Simona Halep in a topsy-turvy encounter, 5-7 6-4 6-1 in one hour and 53 minutes. After an early exchange of breaks, Wozniacki took control of the first set and looked the much sharper of the pair as she quickly raced into a 5-2 lead. Note that both players had already played their third round matches in the morning – Wozniacki beat Elena Vesnina, 6-1 6-2, while Halep battled past Tsvetana Pironkova, 6-7(6) 7-6(4) 7-5. Winning just one point in her first two service games, Halep finally got her serve going to stay in touch. Wozniacki looked to be on the verge of winning the first set, leading *5-3 *30-15. However, with a double fault and two errors, Halep broke back. The break felt like a drop in Wozniacki’s level. With the opportunity presented by the Dane, Halep upped her game and intensity, and got stuck into rallies. Errors (note quite a few were forced) began to creep into Wozniacki’s game as Halep turned the tables to win five games on the trot. Halep continued this burst of momentum into the second set – the Romanian player hit a gorgeous forehand winner down-the-line to seal the double break and win her eighth consecutive game. To her credit, Wozniacki didn’t go away and managed to get both breaks back, jumping on a pair of Halep second serves to level up at 4-4. This was the most entertaining stage of the match with some enthralling extended rallies. Wozniacki held a marathon service game at 4-4 where she saved four break points. The Dane chucked her racquet after a few errors but battled hard – before one of the break points, Heather Watson and Barbora Strycova were coming onto the adjacent Court 1 and Wozniacki had to abort a ball toss when the announcer shouted over the tannoy, “Heatherrrrr Watsonnnnnn”. This got a chuckle from the crowd! Serving to stay in the second set, Halep played a poor game and was broken to love with a double fault, errors and a puzzling drop shot down set point. The quarter-final went the distance and after the pair exchanged early breaks, Wozniacki ran away with the decider. The Dane hung tough in a four deuce game at *3-1 where she saved a break point. Wozniacki dropped just one more point as a tiring, Halep seemed to run out of steam. There were a couple more tired looking drop shots from Halep and Wozniacki was much more effective on serve with Halep only winning three points behind hers in the third set. Wozniacki ended the match by winning 10 of the final 11 games. 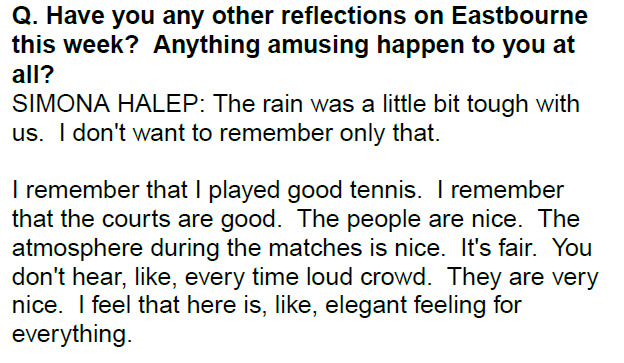 Halep was first in press and generally seemed positive about the matches she had in Eastbourne. This was followed up by a question from another journalist about her time in Eastbourne. I hope she’ll come again – it’s been great to finally watch some of her matches live and get plenty of pictures! And finally, I asked Simona about her preparations for Wimbledon. 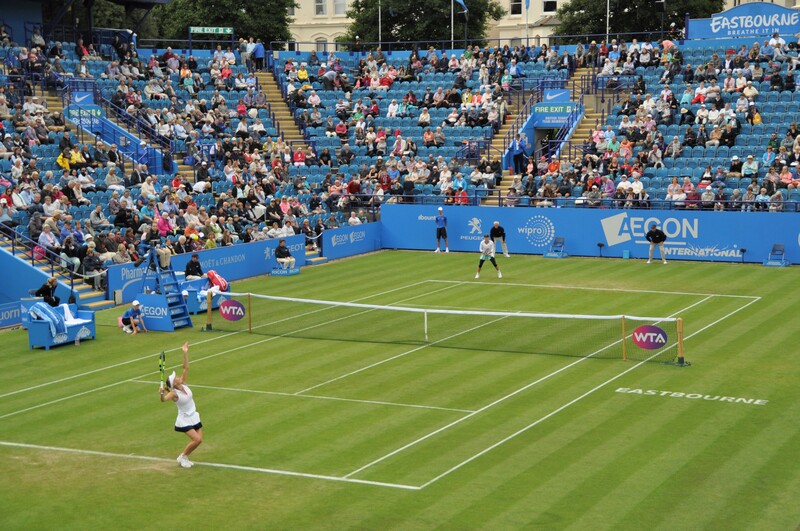 Wozniacki talked about how she likes Eastbourne – this will be her fifth semi-final at this tournament! 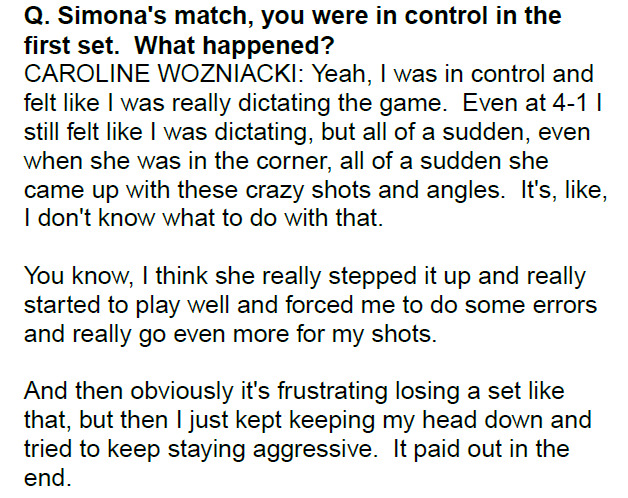 Wozniacki also explained what she felt happened at the end of the first set. Despite the loss, I think that coming to Eastbourne was a very positive move for Halep and getting three matches (all three setters) under her belt before Wimbledon will no doubt have helped her to adjust to the grass quicker. She should have time to rest up before play gets underway on Monday/Tuesday and I think she’ll be one to watch having previously reached the semi-finals and quarter-finals of Wimbledon in 2014 and 2016 respectively. Wozniacki progresses to the semi-finals of Eastbourne where she will play Heather Watson. The pair are tied at 1-1 in their head-to-head (both encounters in 2016) and have never played each other before on grass.